I Have the Need … the Need for Speed. The Feast of Our Lady of Guadalupe. • [Responsorial] Judith 13: 18-19. The Second Tuesday of Advent. • Psalm 96: 1-3, 10-13. • Psalm 49: 2-3, 5. 10:53 PM 12/12/2017 — I am so grateful that you extended this invitation to me to share this special day with you, and especially for your generosity to our beautiful Shrine which you have come to know and serve so well. Because it’s late and already dark, and I have a long drive to return there, you’ll forgive me if I want to be brief tonight. It’s hard to believe that it’s been six centuries since the Mother of God appeared to Saint Juan, and asked him to advocate for the building of a shrine to manifest Her love for all mankind. 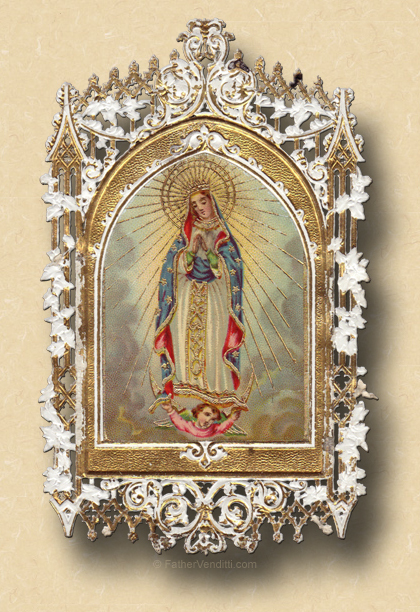 Now, the Basilica of Our Lady of Guadalupe is the most popular pilgrimage destination in North America, and the miraculous image our Blessed Mother imprinted on Saint Juan’s tilma is one of the most venerated images in the Catholic world. 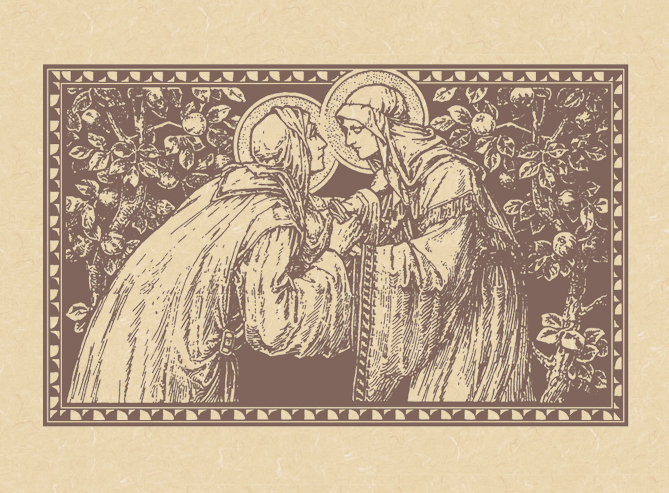 The Roman Missal offers us two different Gospel lessons from which to choose on this wonderful feast, both from Saint Luke: one, his account of the Annunciation, and the other his account of the Visitation, which is the one I chose, though I would have loved to have both. 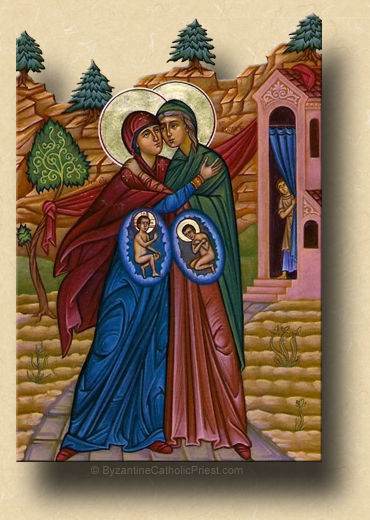 At the Annunication, our Blessed Mother received the news that She would be the Mother of the Savior, but included in Gabriel's message to Her is the news that Her cousin is expecting. Our Lady knows that Elizabeth is quite a bit older than She is, and we all know that a pregnancy in a woman's older years can be precarious and difficult, especially for someone who has not had children before. As the lesson we just heard begins, the very intuitive Saint Luke reports to us: “In the days that followed, Mary rose up and went with all haste to a town of Judah, in the hill country…” (1: 39 Knox). I wish I had the time to explain the careful attention that the Blessed Evangelist Luke gave to this first chapter of his Gospel, his marvelous facility with the Greek language with which he was raised, and his attention to the meaning of every word he uses. And there is one word in this opening verse that deserves our attention: σπουδῆς, an adverb taken from the verb σπεύδω meaning “to hasten,” from which we get our word “speed.” Our Lady proceeds “in haste.” She puts all she has at God's disposal. In an instant, all her personal plans—and no doubt she had many—were discarded so that She could do everything God wanted. She made no excuses, had no reservations, and wastes no time; but consider what She wastes no time to do. Among the few episodes of the Gospel that refer to Her, two of them speak directly of Her attention to the needs of others. Right after receiving from Gabriel what had to be striking news for Her, She runs full steam to Her cousin to help her during what She obviously reasoned would be a difficult pregnancy for someone so up in years. Later, She would express concern to Her Son for the young couple and their guests at the wedding in Cana. Such is the temperament and solicitousness of Someone conceived without sin, without a selfish bone in Her body. No doubt Her neighbors in Nazareth could have told us about Her many little services to them over the years. Far from being an instinctive inclination, love is a conscious decision of the will to draw close to other people. To be able to love truly it is important to be detached from everything and, especially, from self, to give gratuitously.… This detachment from self is the source of a balanced personality. It is the secret of happiness (Address of June 1, 1980). Today, let us ask the Mother of God to teach us to be generous, first of all with God, then with others, starting with those with whom we live and work in the various circumstances of our lives. She will show us to set aside our own needs in favor of the needs of those around us, thus showing us that the path to true happiness lies in putting ourselves aside, as Her own Son would later say: “…He who tries to save his life will lose it; it is the man who loses his life for my sake, that will save it.” (Luke 9: 24 Knox). * In the extraordinary form, on ferias outside privileged seasons, the lessons come from the previous Sunday.